Rex’s health, both physical and mental, had been failing in different ways for several years. 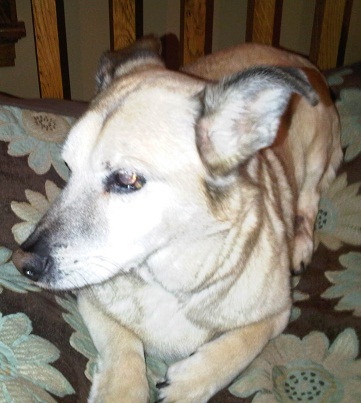 Recently, it had become more painful for him to even just be an old dog in a loving home. His vision and hearing were impaired, there were bumps, skin issues, stress issues, etc. He was in constant pain, whimpering always with each movement or sometimes even when just being still. Getting up and walking without his back legs falling out from under him was challenging. He could no longer manage all of the steps and over the past few weeks had begun to lose control of his bladder and bowels. I am personally struggling with overwhelming sadness at the loss of the first pet I ever brought home with my children when they were very young. Sam, Nicky and I rescued him from a shelter. Chosen out of a large litter of pups, we knew immediately this quirky little puppy with a long snout, big ears and tiny little legs belonged with us!! We admit he was an odd looking pup, but he was ours and to us he was adorable and we loved him very, very much. I wonder now who will follow me around the house (regardless of his discomfort) every time I get up – truly everywhere I went in the house, Rex tagged along. Curled up at my side of the couch, ready to rise each time I did and then settle in again when I did – a true companion! Rex would bounce and bunny hop around when he got excited and would spring to life whenever he saw a tennis ball come out for playtime! Since August with Nick’s cat living with us, Rex found renewed joy and some energy in chasing and playing with Woosie. Playful and sweet, sometimes a bit timid and skiddish, from the moment we brought him home at 5 weeks old, Rex was a simple pup who only wanted love and affection, table scraps whenever possible and the occasional off-leash adventure! Rex was a very important part of our family. He was truly loved and will be very missed. He will always be in our hearts…..
Julie, Tim, Sam, Nick, Ozzy and Sharon and Woosie….